Connie Sherman used to open the freezer to find relief from hot flashes, and it was there that she found her inspiration for HOT GIRLS PEARLS, a line of body-cooling jewelry. HOT GIRLS PEARLS’ necklaces and bracelets are made with “pearls” that contain the same nontoxic gel that’s in ice packs. If you stick the jewelry in the freezer for a few hours, it’s blissfully cool when you put it on and the oversized beads come in contact with your skin. Connie designed the jewelry as a fashion-forward remedy for people with menopause symptoms, but that’s not the only crowd that feels hot and bothered. 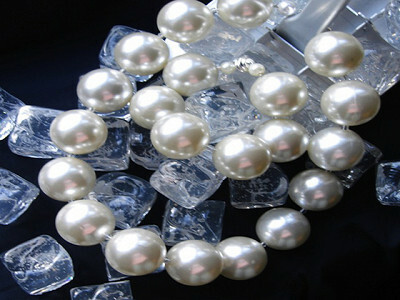 HOT GIRLS PEARLS are a cool treat for expectant mothers who get uncomfortably hot during pregnancy. They can also provide relief to people who suffer from medical conditions that cause heat intolerance. On a steamy summer day, or during a round of golf, or when you know you’re going to be in a stressful situation -- there are many scenarios where a little cool-down goes a long way. HOT GIRLS PEARLS offers necklaces, bracelets, and an insulated travel purse that keeps the frozen jewelry cool until you’re ready to wear it. Once you don the jewelry, the frosty pearls stay cold for 30-60 minutes, on average. The look is classic, and the body-cooling function is discreet. It’s just what you need to go from flustered, flushed and feverish to cool, calm and collected. Hi all! I'm really excited that HOT GIRLS PEARLS are today's featured Grommet. Nothing makes me happier than hearing from women who give the Pearls a try, love them, and tell their friends to check them out! I always feel that I've heard every comment about them possible, so I'm shocked when I hear a new one. My two favorites so far? Do these big icy cool pearls make me look thin? I put them on I feel cool. I take them off I feel cool. Totally brilliant! I'll be around today to answer any questions you have, so drop a line. And keep cool! Please ---- it is 'discreet' NOT 'discrete'. Thanks for catching that! I've alerted the necessary person and it will be changed. What is the size of the 'pearl"? Hi Cathy. The 'pearls' are 28mm. A bit bold, but have to be to hold enough of the gel to make them work so well! Bravo! I am a pearl girl and have a charity- Beauty Becomes You that uses the Pearl as our life symbol as the population we serve is senior adults. "Pearls of Wisdom" We have a FR event in May in Atlanta- Small,exclusive event but some big media. Wondering if you'd like to be a sponsor and participate in our silent auction? Again...BRAVO!!! or should I say..."Cool"? Hi, and thanks for writing. As you can probably imagine, we are asked quite often for donations and other means of participation in a wealth of good causes. As we are still a very small company, we aren't able to honor all the requests we get. We will keep your information, and if able to help, will contact you. Thank you so much for thinking of us. It means so much. @Constance Sherman , I do not know where you live,but you might want to take a charity in Louisiana up on an auction item. So hot here and this is a great way to stay cool and still look great. The Cancer Society of Baton Rouge has a big event in October, with all the big $$$ people there. Great way to advertise. Should sell them on wedding sites for the people who have outside weddings here. Love them, they look great. Good luck in your business. @Suzy Hannah Hi Suzy. I hope you understand how many requests we get every day from different great causes and events that would like to include HOT GIRLS PEARLS. If we said yes to all, we would not have anything to sell, and thus not be in business. We do have an annual budget allotted for charity, and weigh all options throughout. Thanks for your request, but I'm afraid we just can't help everyone. Remember, we are a very small, new company. Curious about the weight of the pearl necklace. What is the average length of time that a necklace will stay cool? The video states that it's around one hour. I've been a tester myself and would agree with this statement. Is there condensation as you're wearing the pearls? Great question! I tested the product and did not find any condensation when wearing them. We have a family wedding in July. Think this is just what I need! You are a genius. Will you be adding other styles too? And for all the people asking for donations, please consider purchasing these items from the business and then auctioning them at your event. I work in a small, local retail shop and we get asked about four times a day to contribute to special events. Really, it's too much! @ Michelle Michelle, you are absolutely right! It does get a bit difficult with people who have good intentions, but forget that we have a business to run! Thanks for your note, Michelle, and remember, keep cool and look hot! Where and how to view and order? If you look at the main screen with the large image of the woman wearing pearls, the right hand side of the screen has an orange box that says "Add to Cart" Above that, you'll need to select your style and quantity. Let us know if you are having any more trouble, or you can call our customer service dept and order over the phone or email. Connie Sherman used to open the freezer to find relief from hot flashes, and it was there that she found her inspiration for HOT GIRLS PEARLS, a line of body-cooling jewelry. HOT GIRLS PEARLS’ necklaces and bracelets are made with “pearls” that contain the same nontoxic gel that’s in ice packs. If you stick the jewelry in the freezer for a few hours, it’s blissfully cool when you put it on and the oversized beads come in contact with your skin. Connie designed the jewelry as a fashion-forward remedy for people with menopause symptoms, but that’s not the only crowd that feels hot and bothered. 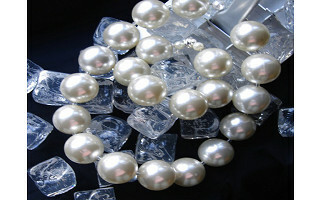 HOT GIRLS PEARLS are a cool treat for expectant mothers who get uncomfortably hot during pregnancy. They can also provide relief to people who suffer from medical conditions that cause heat intolerance. On a steamy summer day, or during a round of golf, or when you know you’re going to be in a stressful situation -- there are many scenarios where a little cool-down goes a long way.